Smarter thinking isn’t about you. It’s about your team. Organizational life is riddled with bad decisions that, at the time, seemed like good ideas. How come? Coined in 1971, the term “groupthink” describes the phenomenon of people making decisions by consensus, with little to no thought given to alternate possibilities. It happens when teams prize their sense of belonging in the group over the quality of the group’s decision-making. Fortunately, there is a trusty antidote to groupthink: diversity. 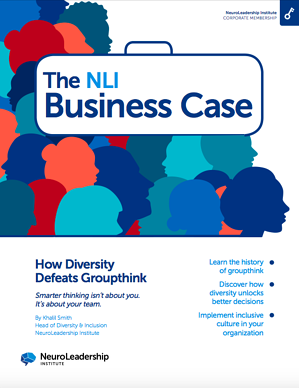 In “The Business Case: How Diversity Defeats Groupthink,” NLI unpacks the science and insights around groupthink, and reveals how dissent — when leveraged just right — paves the way for breakthroughs.